Spain’s most famous wine region is continually going through a bit of a revolution, its superb wines reinventing themselves to make the most of new wine advances; one decade it is experimentation with French oak barrels instead of the large American oak vats which were traditional to the region; another decade it is an in-depth exploration of vineyard sites and crus which is being discussed. Rioja is a beautiful region in northern Spain with rolling hillsides, historic towns and lots of history. The wine region is divided into three zones – Rioja Alta, around the town of Haro where most of the traditional estates are located, Rioja Alavesa which is part of the Basque country and includes villages such as Laguardia and Samaniego and Rioja Baja, which is the arid zone to the south east around the town of Calahorra. Rioja is located south of the Cantabrian Mountains along the Ebro River, at an altitude of about 450 metres. Another river, the Rio Oja, is believed to have given the region its name. Rioja’s chief grape variety is Tempranillo, Spain’s most noble grape, which can be blended with local varieties such as Mazuelo, Garnacha Tinta and Graciano for the reds and Viura and Garnacha Blanca, for the white wine. Rioja has a very long history dating back to the Phoenicians; the first document detailing the quality of the wine dates back to 1650. Extensive oak aging has been a traditional characteristic of Rioja but this has gradually decreased so that the top wines are aged for a maximum of 4 to 8 years in oak. There are four classifications of Rioja wines: Rioja, Crianza (aged for two years, one in oak), Rioja Riserva (aged for three years, one in oak) and Rioja Gran Riserva (aged for at least two years in oak and three years in bottle). Rioja wines can age incredibly well and they are much appreciated in gastronomy for their matching with grilled meats, cheeses and Mediterranean dishes. Our brief for Ed Adams MW was to find us a modern style Rioja with not too much barrel aging so that we could enjoy the bright, fresh cherry fruit flavours of the Tempranillo grape. Working with Bodegas Manzanos in Rioja Baja, he has made a wine with excellent red berry and spicy fruit with refreshing acidity balanced by fine vanilla flavours from aging in a mix of American and French oak. 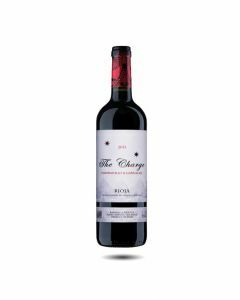 The Charge red is made from 70% Tempranillo & 30% Garnacha grapes, harvested mid September 2016. Ed has increased the percentage of Garnacha with this producer since it is so good! The 2016 is bright and juicy with good generous fruit flavours and an attractive, warm, rich flavour of oak. Drink young alongside roast lamb and stews.